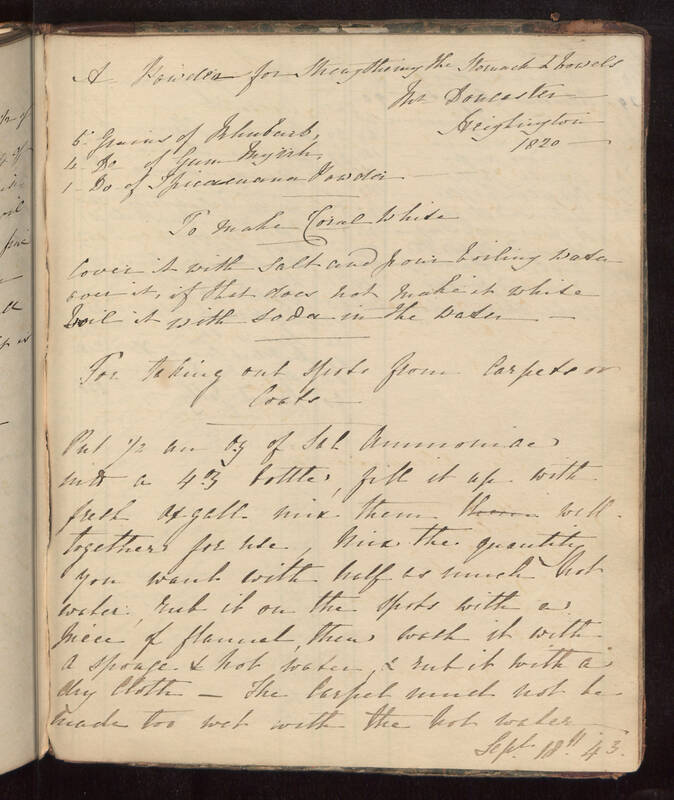 A Powder for Strengthening the Stomach & Bowels Mr Dorcaster Reighinton 1820 5 Grains of Rhubar, 4 Do of Gum Myrrh, 1 Do of Ipicxuana Powder To make Coral White Cover it with Salt and pour boiling water over it, if that does not make it white boil it with soda in the water -. For taking out spots from Carpet or Coats Put 1/2 an oz of Sal Ammonuae into a 4 oz bottle, fill it up with fresh axgalt mix them well together for use, Mix the quantity you want with half as much hot water; rub it on the spots with a piece of flannel, then wash it with a sponge & hot water & rub it with a dry cloth - The Carpet must not be made too wet with the hot water. Sept. 18th 43.